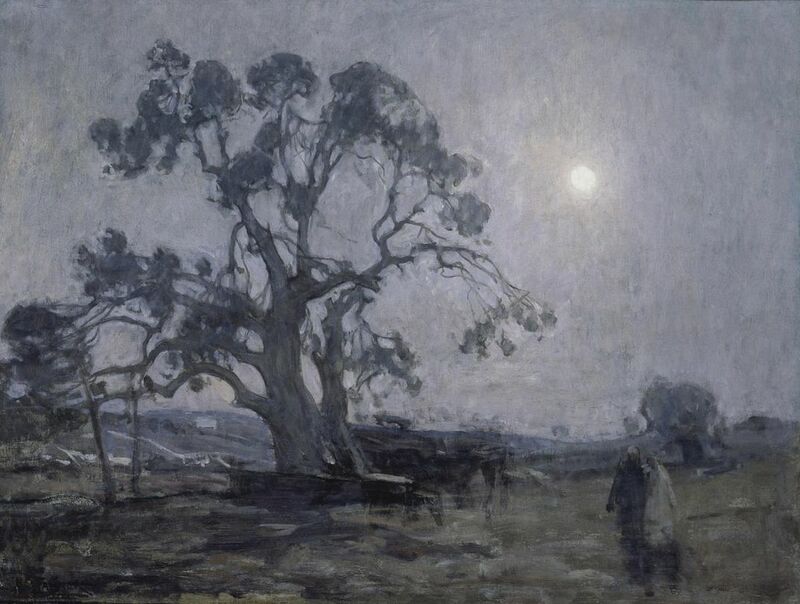 A Souvenir from the Holy Land: On Henry Ossawa Tanner's "Abraham's Oak"
In Henry Ossawa Tanner’s Abraham’s Oak, an ancient tree rises against a misty blue-grey sky, like a monument in the murky realm of memory. The first internationally renowned African-American painter, Tanner journeyed to the Holy Land in 1897, thanks to funding from Rodman Wanamaker, a fellow American expatriate who—like his father, the department store magnate John Wanamaker—was a major patron of contemporary religious art. For four months Tanner traveled along a popular tourist route through Palestine and North Africa. With the Wanamakers’ support, Tanner returned again to Palestine for another six months in 1898-99. Tanner’s Abraham’s Oak memorializes a pilgrimage site that the artist likely visited during his travels: a great oak tree on the plain of Mamre, a few miles north of Hebron, just off an old Roman road to Jerusalem. According to tradition, it was beneath this tree that Abram (not yet Abraham) pitched a tent and built an altar to the Lord of Israel after God’s promise of the land of Canaan to him and his offspring (Genesis 13). Having pitched his own tent in Palestine in 1898-99, Tanner may have identified directly with this story of Abraham encamped on the plains of Canaan. Abraham’s lifetime of wanderings perhaps also resonated with Tanner, as an expatriate who spent his mature career in France, separated from his American homeland. After all, it was not long after God’s command to Abraham to enter into exile—“Get thee out of thy country, and from thy kindred, and from thy father’s house, unto a land that I will shew thee” (Genesis 12:1)—that the patriarch first made a dwelling place beneath the branches of this great oak. Tanner, too, had felt called to leave his country and kindred in pursuit of an artistic career in a foreign land. Postcard of “Abraham’s oak at Hebron,” after a watercolor (ca. 1898) by Johann Friedrich Perlberg (German, 1848–1921), printed in Germany. Collection of the author. Tanner described paintings like Abraham’s Oak as “souvenirs” of his experiences in the Holy Land. Yet he would not begin this canvas until 1905, six years after his last trip to the region. The painting is indebted, then, to another form of souvenir: those paintings, prints, photographs, and other popular images of the Holy Land that circulated among audiences in Europe and the U.S. (Tanner himself owned multiple prints of sites in the Near East, which are now in his papers at the Archives of American Art.) In a postcard of the famous oak near Hebron, which reproduces a watercolor from around 1898, the tree sprawls across the sky, its gnarled branches and verdant foliage leaning leftwards as if offering shade to the figures gathered below. Given the similar point of view and silhouette of the tree in Abraham’s Oak, it is likely that Tanner employed one such postcard as a memory aid for his retrospective subject. But what did this tree at Hebron really look like when Tanner saw it in the late 1890s? According to an entry in the Jewish Encyclopedia (1901-6), the oak had significantly weakened in the previous half century due to its considerable age and the loss of branches from lightning strikes. Two accompanying illustrations of the tree, one from 1847 and the other from 1897, show the severity of its deterioration. Tanner’s painting balances the actual appearance of Abraham’s oak around 1897 with the tree’s mythic proportions in popular imagery. Here, the tree looms large over the scene, strong, solemn, and colossal, like an individualized bodily presence. At the same time, two struts prop up a low-hanging branch at left, while leaves sprout only at the extremities of otherwise bare limbs, suggesting not just its antiquity but also its withered condition. 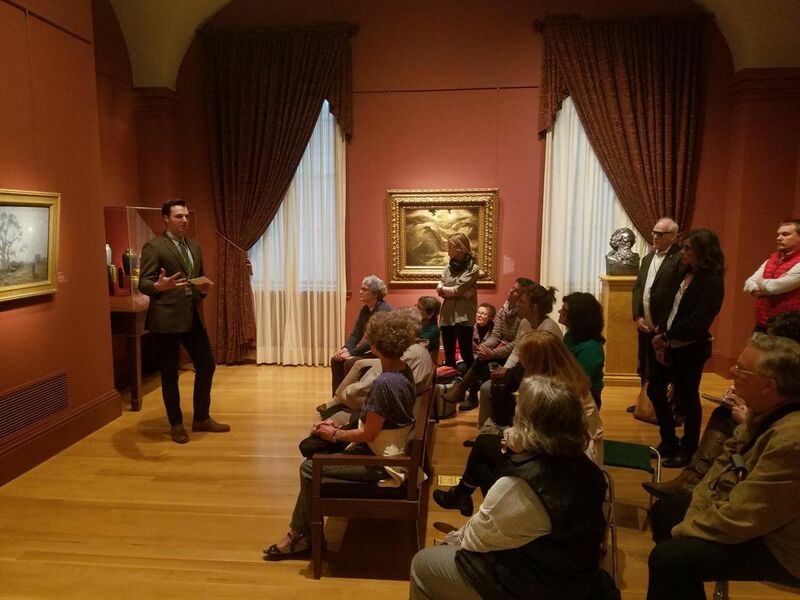 Jeffrey Richmond-Moll discussing "Tanner's Oak" as part of the Art Bites series. Rendered in his signature nocturnal blue palette, Tanner’s painting is as much a portrait of an actual pilgrimage site as it is an inward vision, resonating with mystical feeling and spiritual import. In the dim light, hazy glow, and thick nighttime air, Tanner conjures a cloudy space of recollection, summoning the memory of his own encounter in the Holy Land six years prior, and then transposing it into a mystical apparition from an imagined, primordial past. This blog post is based on Art Bites, a continuing series of lunchtime talks at the museum. They feature the voices of SAAM's research fellows who share their discoveries about artworks from the collection. 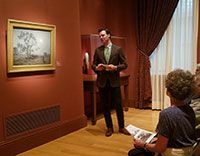 Jeffrey Richmond-Moll was the 2017-2018 Joshua C. Taylor Predoctoral Fellow at SAAM, where he researched the intersections of religion and modern mobility in early twentieth-century American art. He is a PhD Candidate at the University of Delaware and is currently completing his dissertation as a Luce Foundation/ACLS Dissertation Fellow in American Art.